iZombie - The Exterminator - Review: "This Brain, It's Not Who You Are"
I'm in. Not that I wasn't in before, but now I'm really in. I had my doubts about this show after watching last week's episode, and I was on the fence as to whether the show was really ever going to find a voice, but this week, SOLD ME. The Exterminator was a fine hour of television, and felt like the follow up episode to the pilot we should have gotten. 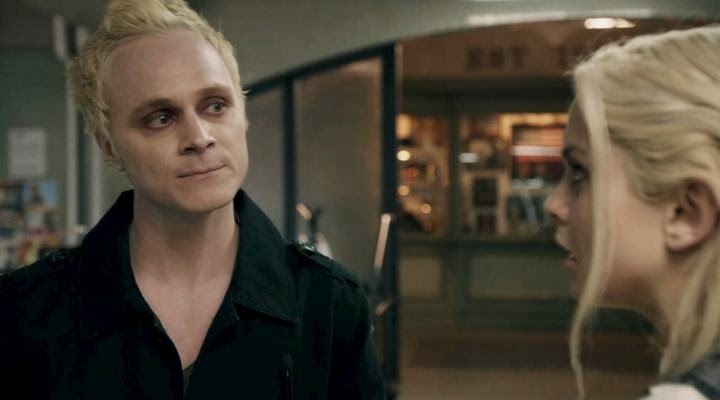 Not that Brother, Can You Spare A Brain? did not have things going for it, just it was a follow-up that had the unlucky pleasure of following a rather solid pilot. The Exterminator really helped solidify the foundation of the show and was damn good hour (That some great RaviOli moments). I can't wait for a rewatch so I can have a quote off with my friends in the near future. "Ravi: Should be a pretty safe brain to eat. Liv: Said nobody. Ever." This week's brain is that of Marvin Webster, mild-mannered pest control worker who was a victim of a hit and run. In unrelated but related news, Liv comes home to a very excited Payton celebrating the death of tech guru Wally Walker. She turns on the TV to show a press conference where Wally's widow is thanking her husband's Angel Investor(Someone who donates money as a reward for information about someone's murder) Don Watts, and the informant Freddy Brown just as Payton walks up in her power suit. Payton's boss, the DA has given Payton the lead in prosecuting this case. Payton is a bit nervous so she asks Liv to practice her cross exam with her. Liv agrees, and ends up just a bit more than she bargained for. She flashes to see that mild-mannered Marvin is the one who murdered a pleading Wally, not Gus Williams the homeless man. Liv takes this information to Clive, claiming that it was awfully convenient that someone was arrested before the company went public and he reminds her that Wally is not their case, Marvin is. Liv tells them that the two are connected by something about debts, but Clive laughs her off. He tells her that they need to focus on Marvin and that without evidence there is nothing he could do to exonerate Gus. Liv walks off after telling Clive that if he won't do anything she will. And then she deduces based on the residuals from his brain that Marvin was a sociopathic hitman. She heads back home and again greeted by Payton, who this time shows her a video of Major kissing some woman. Liv is void of response thanks to Marvin's residuals much to Payton's confusion, and Liv laments how she feels nothing,well nothing but her curiosity. She picks up a confidential file of Payton's when she walks off and discovers Wally had a gambling problem. Liv reveals this information to Clive and asks him to come with her to lean on Wally's bookie, especially since when Marvin murdered him he was going on about paying off his debts. Liv tells Clive that whoever ran down Martin probably hired him to kill Wally. Clive agrees to go see the bookie with Liv, who is Frank Smith, a former cop who owns a cop bar. Liv can't help but play the trivia game going on at the bar, (where the trivia admin is dressed as Jeannie from I Dream of Jeannie and her team name is Piggy & the Brain) and Clive lets out some witty barbs. Clive comes back from the restroom to find Liv questioning Frank. 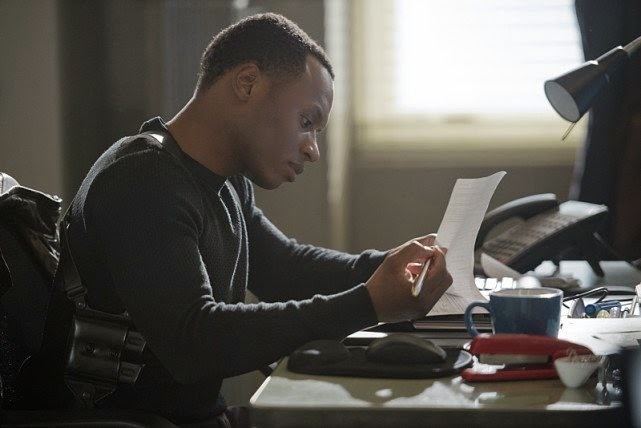 Frank confirms that Wally was in the hole, and he had last seen him on June 8th(the night of the murder) but that he had promised to pay up in a couple of months more than what he owed. Liv notices that on June 8th, Marvin was also in the bar and must have followed Wally out and killed him. Clive and Liv head to Webster's home and and look through his things and end up finding the murder weapon that killed Wally. Liv has another vision, this time of Marvin dying during his accident. She gets a partial plate and the color of the car. Back at home, Payton confronts Liv about her digging through her file busting up her case and setting back her career and Liv once again shows no remorse. Liv's sketch of the car gives them a lead on who may have killed Marvin. The suspect bought the car the day before the murder, and the suspect is Don Watts, Angel Investor and business partner of Wally. Clive and Liv bring Don in, but he and his lawyer managed to wiggle their way out of the situation. Stumped, they head back to Marvin's place and check his GPS in his car which leads them to his last known vacation. They travel to the park where Liv gets a vision of Don and Marvin talking revealing there was a garbage man as a witness. Clive brings Don back in and reveals they have a witness. Don ends up signing a confession and taking a plea deal when pressed by Clive and Payton. Turns out the garbage man was just Ravi, playing the role since the original garbage man couldn't remember anything. Later, Liv contemplates eating more of Marvin's brain to help numb her feelings from what's going on her life, but she decides against and realizes pain is what makes you feel alive. "Two's Company, three's a horde"
This week actually opened with a scene that managed to subvert my expectations, I thought the two boys filming in the abandoned dockyard were going to discover this week's dead body, L&O style, but what they end up finding is so much better. Is anyone surprised that Ravi has a Google alert set up for the words Zombie and Seattle? I'm not. Anyway, it's the alert that some kid posted a picture of what he said is a zombie that draws Ravi's attention and Liv's concern. Ravi wants to look into it and Liv agrees to tag along. It was in fact a zombie that the kids found, Zombie-Marcy, Liv's pre-transition sort of med-school nemesis that invited her to the party where she met her un-death. Liv identified Marcy by the pearls she was wearing. Marcy isn't looking so hot either, months of no brains to eat has turned her into a melted candle looking zombie. Ravi is expecting Liv to be distraught, but thanks to Marvin's residuals, Liv's response is to throw a rock at Marcy. 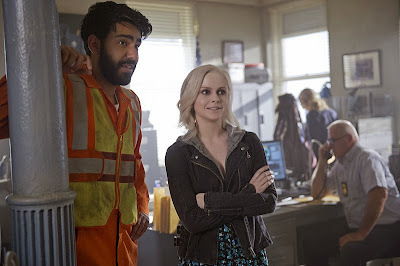 Ravi treats this as an experiment to see if a zombie can be too far gone to come back to a normal-ish state like Liv, slipping Marcy a brain and vowing to return. 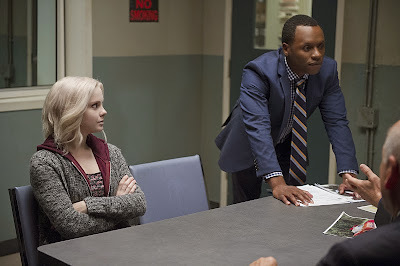 Later at the morgue, while Liv is considering eating a new brain because the residuals of it, Ravi admits to her while attempting to guilt trip her that he believes that his experiment with Marcy is going to work. Unfortunately, Ravi isn't right in this case and there is no change in Marcy. Liv decides the best thing to do for everyone's safety is to put Marcy down, but Ravi persists out of what Liv knows is fear. Ravi tries to convince Liv that Marcy is a person, but Liv is hearing none of it and heads to find a weapon. Ravi pleads with Liv to just let him do the biopsy and see what happens, and as he tries to get it, he ends up being pulled in the pit with Marcy. 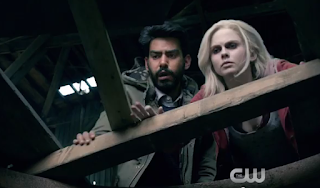 In a rather tense moment, Liv watches on as Ravi fights off Marcy, before waking from her stupor and jumping in, going "Full-Zombie" and killing Marcy. Ravi calms her down and afterwards consoles Liv who is upset she almost let Ravi die thanks to Marvin's brain. He lets her know that she still found her way through the sociopath in her system and saved him. Ravi affirms to Liv that the brain is not who she is. They are both called away by Clive putting an end to the sweet RaviOli moment. We later see that Liv, reeling from her guilt and needing to dos something about it, watches as Marcy's mother opens a letter from Liv with Marcy's pearls inside. Blaine shows up earlier on in the episode to ask Liv why she didn't show up with brains like she promised. Blaine pokes at her facade by pointing out just how easy it is for her to get brains, and Liv flat out tells him that she doesn't trust him, and Blaine realizes it's every zombie for himself. Major shows up at the station later looking for Liv's help, after her ignoring her apology for her sudden passionate outburst last week. One of the kids that Major mentors at the Helton Shelter, a halfway house, had his roommate go missing. They filed a missing report but have been met with little movement from the cops. Jerome tells them that Eddie was freaked out by a man the kid's have been calling Candyman. Candyman has been at the skate park Nitro handing out Utopium and luring kids into his van. The final scene is of Jerome handing out flyers at the skate park, and being met by Blaine, who assures him he knows where Eddie is and leads him away from the crowd. "That's the thing about pain isn't it?...Really feeling it doesn't make it stop, it just shows you you're still alive"
Overall Thoughts: This was a really great episode that after watching it really has me feeling guilty for having doubts about Rob Thomas & Co., as it had me glued to the screen for the entire hour. This week I felt there was good synergy with the case, the zombie plot, Liv's character growth and the supporting players. We got to see parts of all the players in Liv's life and it felt like progress was made. Marvin Webster's brain could not have come at a better moment for Liv. Sure, it made her come off as cold and calculating, but for what needed to be done this episode it was perfect. I loved how even though she had been making some sort of progress in her personal life, this brain caused the tiniest of setbacks to her relationships. Liv brushed off Major, who had been ignoring her apology, when he apologized for ignoring her. Which, probably hurt Major, because it shows to him that Liv has gone back to not caring about him and his feelings in this very messy relationship. Something that is obviously not true, as she finds herself overcome with emotion at when reviewing that video of his kiss again at the end of the episode. This week's brain meant a lot especially when it came down to defining Liv, because when faced with the choice of not feeling the consequences of what she has done by eating more of the brain, she choose not to. She chooses to feel, she chooses to be alive. Liv has already come a long way since the pilot, in her choice to live now that she's dead. This week she was choosing to feel, when she chose to save Ravi despite the residuals of this week's brain, and when she chose not to numb herself over her guilt over Marcy and Major. Liv owned up to her consequences, something most of us don't do, and it was great. 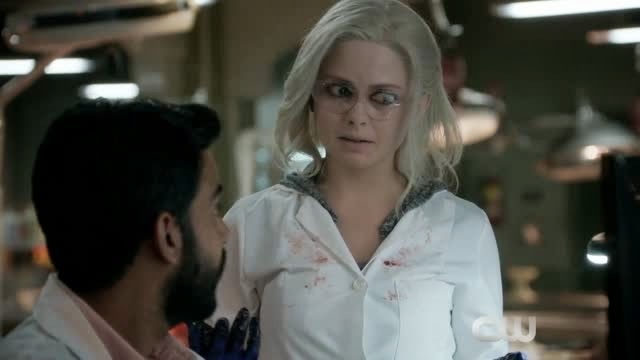 Rose McIver does a fantastic job of giving Liv's portrayal the right amount of mannerisms and charisma, that really sparks the portrayal of a zombie-heroine. I love RaviOli. I love them so much I'm forcing a ship name down your throats. Their banter and bond is so great, I would really hate to see it tampered with. How will Ravi see Liv now that he knows what could happen to her if she doesn't feed, and that for a brief moment the brain she ate almost let him die? Sometimes I worry that Ravi is so desperate for answers that his recklessness in obtaining them will seriously put him in danger like it did here. He is inherently good and really wanted to work to save Marcy, which is honorable, but his was really beyond his depth and risked leaving Liv with another zombie problem had he gotten turned. Still, his ability to see the good in Liv and appear to still trust her after what happened is why I love RaviOli so much. 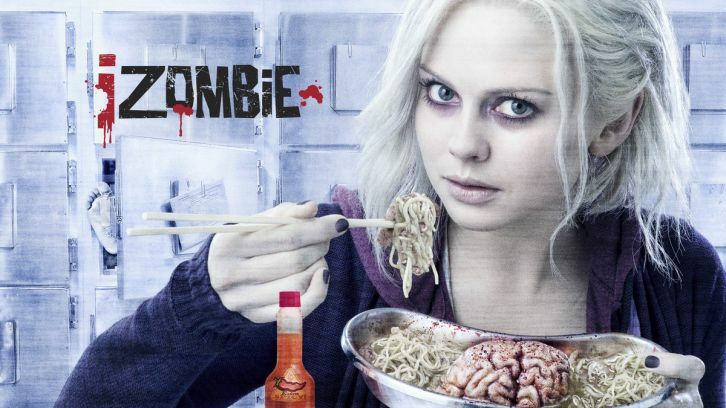 Side thoughts: Can Z-date and the Noxious Zombie cocktail be a real thing? Also, how cute was Liv when Ravi said there was a picture of a Zombie and she asked if it was her. Check out this awesome twitter account and these awesome podcasts! Live and Let Clive airs Tuesday, April 7th at 9pm on the CW. What did you think of Episode 3? Are you still watching? What are you looking forward to most as we go forward? Was Liv wrong to kill Marcy? Sound off below!